Birthday: November 8 Zodiac: Scorpio Age: 35 Ninja Registration Nº: 33-001 Blood type: AB Height: 164.1 cm Weight: 47 kg Classification: S-rank, Missing-nin Sasori, also known as Sasori of the Red Sand, was the grandson of Chiyo and a member of Akatsuki prior to his death, and was partnered with Deidara, and Orochimaru before that. When Sasori was young, his parents were killed by Sakumo Hatake, leaving him with no one but his grandmother, Chiyo, to take care of him. To cheer up Sasori, Chiyo began to teach him the art of making puppets. He began making puppets at the age of five, and even made puppets that resembled his parents to get rid of the terrible loneliness he felt. But because they were only puppets, incapable of giving him the natural parental love he desired, he lost interest in them. They later fell into Chiyo's possession. Sasori proved to be a born natural at the art, even devising masterful ways of eliminating a puppet master's weakness. Sasori created many ingenious puppets, including the ones that were owned by Kankurō. During the Third Great Shinobi World War, these puppets were used so successfully, they dyed the sand red with blood. 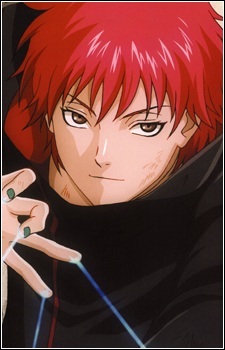 This gave rise to to the name Sasori of the Red Sand. Twenty years before his introduction in the series, he left Sunagakure, though not before secretly kidnapping and killing the Third Kazekage. More than that, Sasori eventually made more then one puppet body in his image maintain his youthful appearance and increase his own offensive capabilities, but retained his heart — the only still-living part of his body — in a cylindrical container in the left part of his chest, he claims was his only weakness. Sometime after leaving the village, Sasori joined Akatsuki, and was eventually paired with Orochimaru. They had great respect for each other during their partnership, and did many things together. After Orochimaru left Akatsuki, Sasori was teamed up with Deidara, although he always carried a grudge against his former partner. He sent Kabuto Yakushi to spy on Orochimaru, but Orochimaru dispelled Sasori's jutsu and convinced Kabuto to join him. Sasori was also shown having numerous other underlings and spies in many nations, such as Yūra and Mukade.